Kenilworth Castle is a partially ruined castle in Kenilworth, Warwickshire, which is about 6 miles (10 kilometers) South of Coventry. 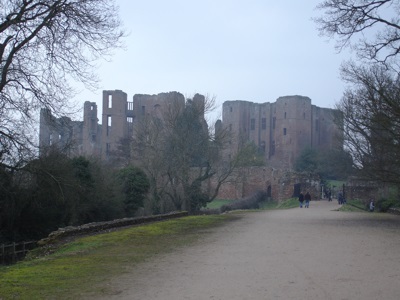 Kenilworth Castle was built and extended over the course of several centuries. Construction began in the 1120s with the building of a Norman great tower. This was later enlarged by King John, and water defences added as well. Later still, John of Gaunt lavishly extended the castle still further. The final expansion took place under the Earl of Leicester, who added a several new Tudor buildings. Kenilworth was partly destroyed by Parliamentary forces in 1649 during the English Civil War, and only two of its buildings remain habitable today. It has become a tourist destination since Victorian times, and has been managed by English Heritage since 1984.